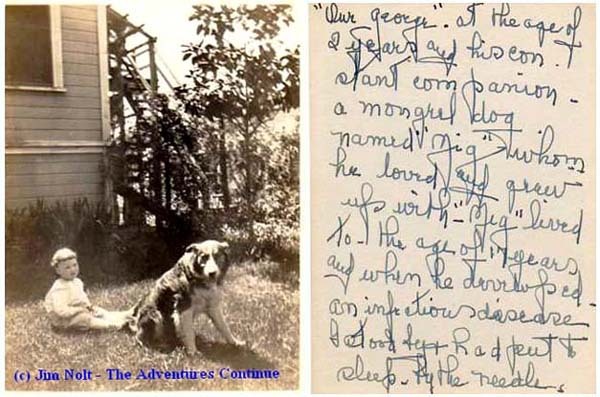 The following photos are of George Keefer Lescher Brewer (Bessolo - Reeves) during his childhood, Helen Lescher-Bessolo, Frank Bessolo and their family dogs. I'd like to extend my greatest appreciation to Serena Enger who if you haven't figured out by now, is fairly new to our George Reeves community. Serena has made a tremendous impact with this telling of Frank Bessolo's life and her previous articles Vital Statistics and Recovering George Reeves. In the short time since Serena entered this arena she has brought forth to us a significant amount of credible facts for us to comprehend. TAC is grateful for her interest and contributions to bringing the life and career of George Reeves to greater heights. Thanks go out to Jim Nolt for providing the priceless childhood photos of George. From the photos and captions that accompany them, one would get the sense that Helen was extremely happy in those early times. 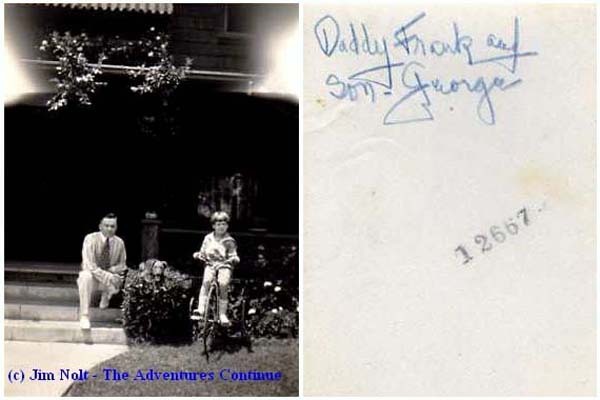 Rumor has it that Helen left Frank because she was jealous of the close bond Frank and George had of each other. Seems a bit of a stretch and I'm inclined to believe there is a more traditional reason which caused the marriage to fail. It was Socrates who said, "The unexamined life isn't worth living." 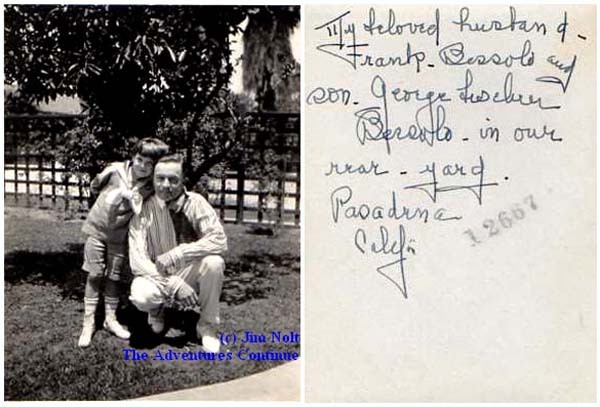 In 1934, while a junior at the Pasadena Community College, George learned Frank Bessolo was not his biological father. He would soon confront his mother who stated she held the truth from him about his real father Don Brewer because the man had committed suicide. A lie meant to protect both George from learning he was conceived illegitimate and her own reputation. If told in truth George would have learned his mother was with child before she and Don were married. 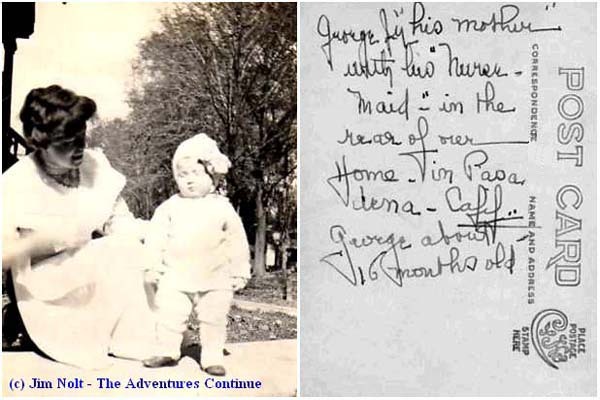 George was an infant when Helen went to the trouble to alter his birth certificate from the correct date of January 5, 1914 to April 6, 1914. Within months of Helen's pregnancy, she and Don would marry, however the marriage lasted less than a year. Considering the times, it was not uncommon for a woman to alter her history in a situation such as this. In Helen's day, a pregnancy while not married was frowned upon and considered scandalous by most accounts. It was a natural tendency for local folks to engage in gossip and pass whispering judgments. The person would undoubtedly be considered someone with lower moral standards. Many feel even today it is unfair to raise a child without two parents. Today our country is more sympathetic towards the hardships of the situation and single-mothers can seek counseling and assistance to help one through the difficulties. In fact, even single-motherhood planning has taken giant leaps forward. In the early days families fearing gossip and tarnished reputations would be far more secretive in their personal matters such as this than it is today. But a question does present itself. Since Don Brewer did marry Helen before George was born, why when George discovered the truth of who his natural father was would she feel the need to escalate the issue by claiming Don killed himself? Wouldn't George have adjusted to the situation better if Helen just stated her marriage with Don Brewer didn't work out and she preferred not to talk about it? Isn't the act of suicide a horrific image to present to your son? The only explanation is that she didn't want George pursuing a relationship with Don Brewer. Most likely against his mother's wishes, he would set out and eventually speak to Don Brewer anyway. Perhaps Helen knew enough to know Don would not accept George simply because of the association to her. We don't know. If Helen felt the need to protect her reputation, her intentions could be considered understandable. However her method to conceal the truth from George cannot be considered noble. But after all, as Serena mentioned in a lengthy discussion we had regarding her research for the previous page; how could Helen know the life of her son, George Brewer - Bessolo would one day be discussed in great detail, analyzed, reported in various degrees of accuracy, speculated or told in (a long list of) mythical proportions. All this due to his stardom as TV's Superman and more so, the result of his tragic death. Does George's life contain clues to his mysterious death? Many believe it does. Thus the odyssey to know and understand. Separate June 16th, 1959 from the equation and George's life is still indeed worthy of examination. We must consider Helen's situation and by all accounts this was her business, her son and her responsibility to nurture and tell the truth in her own time. George learned Frank Bessolo wasn't his biological father from his cousin Catherine Chase, thus initiating the negative feelings George had for his mother throughout various times of his life. If I may inject a scene from Superman on Earth; imagine young Clark (Joel Nestler) learning of his strange powers and abilities from someone other than Sarah Kent (Francis Morris) his adoptive mother. It was her place, just as it was Helen's, to cross the bridge with her son and face the truth of their life's origin. However, in spite of all said and done, I believe Helen would never have told George about his biological father. He would have been something she preferred to forget and a subject she wished to avoid. In our early days (1980's) of gaining greater knowledge about George's life the lie Helen told about Don Brewer had taken on a myth all its own. In the eyes of the world, Don Brewer committed suicide. It simply couldn't be confirmed he did not end his own life. Not until years later we learned from Brewer family members he actually lived a long life and died from other reasons. A mythical story told for years and eventually ended up in Hollywood Kryptonite is of Don introducing himself to George while he stood backstage of Winged Victory. The story as told, makes very little sense. Why would Don travel almost 200 miles (1943: 3 hrs. plus), introduce himself and then reject his son? It doesn't make sense because this meeting never took place. It did however prove Don lived on after the divorce. As a result, the cloud of mystery and confusion caused by Helen's lie to George then shifted to Frank Bessolo. Fans and experts alike would all draw the same confusion. If it where to be told George's father committed suicide, well then it must then have been the act of Frank Bessolo. What other explanation could there be? It would have to been Frank. To some, it would lend support one reason George committed suicide, if you feel the family medical trait or influence theory is completely viable and if you believe the official ruling. A well known example of multiple suicides within a family is those of reknowned writer Ernest Hemingway. Ernest's father committed suicide prompting experts to wonder out loud; "His father had committed suicide, did he feel then it was perfectly ok for him to do the same?" Regarding Frank, years went by with no confirmation either way, and so did the myth. Most of all, a viable explanation was never presented. Refer to all the accounts to date, the books, magazine articles, the television segments, the film, you will be hard pressed to find any cause given, thus supporting my own long-time doubts either ended their life this way. If a reason existed it was never disclosed. Until Serena's finding, research has been weak, at best. One theory told was Frank had lost patience waiting for Helen to return to his side after the divorce, thus ended his life. His marriage to Alice and his legal divorce difficulties with Helen certainly prove he wasn't pining away. The fact can finally be told, Frank Bessolo did not end his own life. What does remain true is Helen told George the lie his biological father committed suicide and the documents she altered in an effort to keep the two forever from knowing each other. And what effect did this lie have on George? We will never know. He had to be disturbed by it up to the time he learned Don was alive and well in the Cleveland area. It is likely he was still bothered his mother would make up such a thing. Perhaps, while in Chicago in 1943 for the Winged Victory stage performance George's phone call (with his wife Ellanora nearby) to Don Brewer was meant to getting to the bottom of the issue. And as we know, Don did reject George, thereby compounding the situation. But Don's reasons may have changed by this time. It would be more than one issue to forget Helen Lescher. At this point Don was remarried and didn't want to rock the boat with his current wife by introducing George into the family. I doubt George was prepared for this rejection, thus experiencing a second disappointment involving his parents. To the best of our knowledge, George never knew he had a half-brother and half-sister. We can only imagine how thrilled he would have been. But how is it he missed getting the message? George had an early version of a telephone voice recorder, was the message left there and he didn't hear it? Perhaps Donald spoke to an answering service and the message failed to reach George? As for Frank, George visited his step-father at his Manhattan Beach home for years after the divorce from Helen. Natividad Vacio and Fred Crane claim to have accompanied George on separate occasions. George's admiration for Frank would remain strong. Unless Helen wasn't of sound mind, I doubt she would ever consider convincing George his step-father Frank died by suicide. She would have to think George was completely naive to trust her with a story that rang much too familiar. The death certificate shown on the previous page, thanks to Serena's research is the absolute proof and lays to rest any and all suicide rumors or speculations regarding Frank's death. There it is stated he died as a result of an embolism. An embolism is defined as an obstruction in a blood vessel due to a blood clot or other foreign matter that gets stuck while traveling through the bloodstream. From this day forward, Father's Day - June 17, 2007, it can never be accurately published, stated, defined or speculated Don Brewer or Frank Bessolo died by suicide since neither passed away in this manner. It is said that George would not speak to his mother for many years for all the secrets she guarded by disception. By the later years of his life as shown in the last photo above, the love is evident and forgiveness triumphs. May you all be at peace for all eternity and truth forever triumph. Randy Garrett once again rises to the occasion (on short notice) to provide a symbolic moment between George and his step-father Frank Bessolo he so dearly loved. You'll notice that Randy didn't simply assign a random likeness in time of George. An image of George during the late 50's simply would not work since Frank had already passed away. 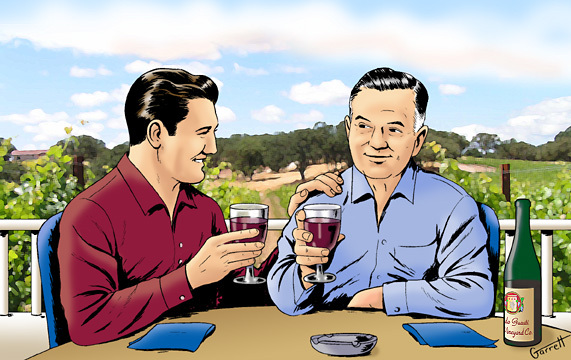 Randy would take the time to render the likeness of both a young George (early 20's) and Frank accurate for a time in their lives together. Randy's effort for accuracy is especially evident in his TAC Superman and the Secret Planet work. As always, TAC is grateful whenever Randy can take a moment from his professional work. For more of Randy's wonderful illustration work visit here. Congratulations to Serena Enger for her discovery and thank you for sharing with us at TAC.